Nordic Skiing in Stowe - The Best in the East! Stowe has some of the best cross country skiing in the east. Since 1968, when the Trapp Family Lodge opened the first nordic center in the U.S., cross country skiing has increased in popularity. An amazing fitness alternative or additional activity to downhill skiing and riding, there is a long list of places you can go. Whether it's a quick, easy, cruise on the rec path, or a day's outing in the back country, Stowe Nordic's ongoing efforts to enhance the skiing opportunities in town, have created options for everyone. Check out the Ski Guide on their website to find out where you can go, and what the offerings in the area are. 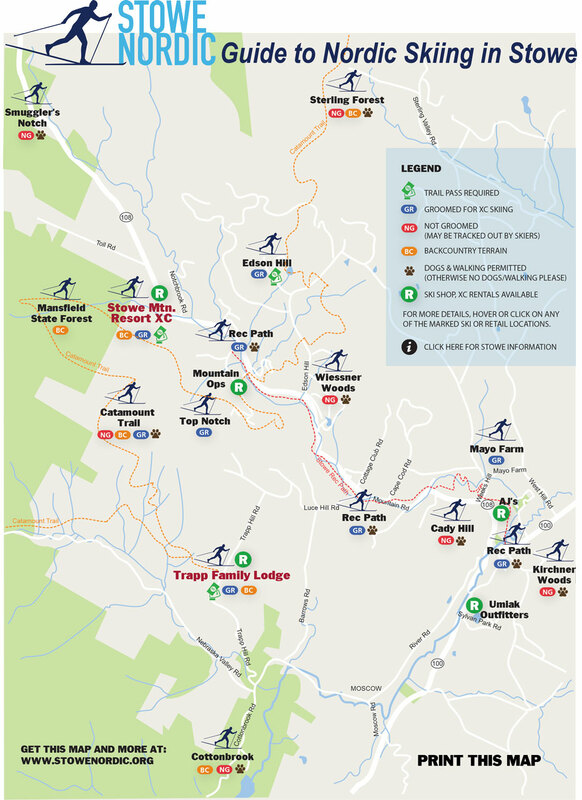 It is a wide variety, ranging from 40 km of trails at the Trapp Family Lodge; to Edson Hill, Sterling Valley, or the Mayo Farm loop, which is groomed by Stowe Nordic. Stowe Nordic is reviving 2 iconic Stowe backcountry events. Both will be low key tours over parts of the Catamount trail. Both tours will depart from the Trapp Family Lodge Outdoor Center on February 11, at 9:00 a.m., with a bus ride to the start and will end back at Trapps where there will be a party afterwards. So, let it snow, and enjoy the trails, right in our backyard!